Mooring rings are situated along the Allegheny River as a reminder of when the space was the Allegheny Wharf. Technically the could be used during flooding, but rarely are. This ring is the lowest in a series of three and across from PNC Park. A mooring area for passing boats along the Allegheny River. Allegheny Riverfront Trail was designed by landscape architect Michael Van Valkenburgh and artists Ann Hamilton and Michael Mercil. Duquesne Way, the Pennsylvania Railroad elevated tracks and the Allegheny Wharf can be seen in this 1910 Hopkins Map of Pittsburgh. River Wall and Wharf on left bank of Allegheny River under construction. Today this area is the Allegheny Riverfront Trail, where people can walk along the river next to native plants and artwork that reflects the nearby water. Prior to the Renaissance I wharfing project, the facing of river, lake or sea walls and embankments with planks driven as piles and secured by ties was very common on the three rivers. Note the Ship Cafe in the right background. These rings are attached to the 10th Street Bypass ramp leading to Fort Duquesne Boulevard. They've been graffitied over and aren't used for their original purpose, but still add to the nautical theme of the Allegheny Riverfront Park. Good Question! listener Stewart Williams noticed these rings while bicycling around the city. Good Question! listener Mike Iagnemma passed the rings on the 10th Street Bypass' retaining wall every day on his way to work and said, 'They look nautical in nature...I would assume they’re something for the river, maybe some sort of safety device for anchoring items floating down the river." Williams noticed two different sets of rings; a series of giant ones attached to columns along the Allegheny River near the Point, and trios of smaller ones lining the 10th Street Bypass retaining wall. The rings on the columns are much larger than those on the bypass, which are positioned in metal brackets along the wall. Both sets of rings are traces of the area’s past as a commercial wharf, according to Pittsburgh history buff Tim Killmeyer. The rivers were one of the main reasons the city developed, he said, so it made sense that the riverbanks were bustling spaces. The Pennsylvania canal ran through the city carrying goods, and shipbuilding was a major industry in the city’s earliest days. The Allegheny Wharf was primarily a hub for industrial traffic, while the Monongahela Wharf was used for commerce and social gatherings. “Just like everybody would go to Point State Park today, everybody went to the Mon Wharf to celebrate Pittsburgh stuff,” Killmeyer said. Duquesne Way filled with cars in 1933. Industrial materials can be seen off the bank of the Allegheny River. This is looking downstream from the 6th Street Bridge toward Stanwix Street. In the early 1900s, Pittsburgh’s population nearly doubled to more than 500,000. On both wharfs, there was no barrier between the water and the land, like a beach. Steelworks, brickyards and machine shops lined the rivers, and barge and freight ships docked nearby to transport products. The bridges on the Allegheny River — 6th, 7th, 9th, 16th, 31st and 40th — had recently been raised, allowing steamboats and additional river traffic to reach the Allegheny Wharf. 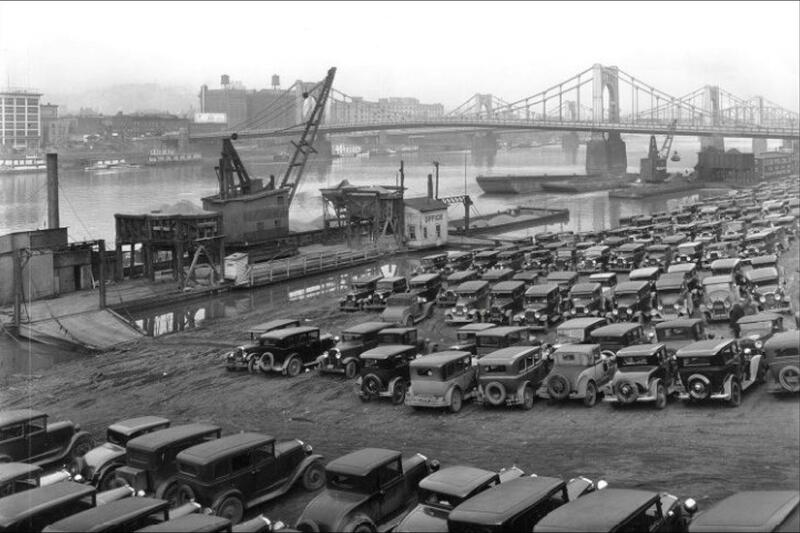 As automobiles gained popularity, drivers would use the wharfs are parking lots. Between the industrial activity, the nearby elevated Pennsylvania Railroad line, and the dense rows of cars, space was running out on the Allegheny Wharf. Developers needed to find a way to route traffic around downtown and decided to build a bypass on the wharf. Construction began on what was then known as the Duquesne Way project, a route parallel to the rail lines leading from the Point to the Strip District. But a persistent issue challenged the builders: flooding. Duquesne Way was frequently inundated by the rising Allegheny River. So as workers finished what would become the 10th Street Bypass, barges or passing boats would tie to the rings on the bypass’ retaining wall to keep from drifting away. “You would bring your boat in and push them against the wall out of the middle of the rapid channel and move them out of the way until the river started to recede,” Killmeyer said. The 10th Street Bypass, along with most low-level roadways near the river, still flood, but improvements to the region’s lock and dam system have mitigated much of the problem. But he said the rings are rarely used anymore. They were never part of a lock and dam system, as some have speculated. Ultimately, they’re a reminder of the region’s rich history of river commerce.